When it comes to some companies here in the the U.S., the incentives are amazing. You can eat for free, do you laundry, work out at anytime, take some time off in a spa and eat for free. Some of these awesome companies even have concierges on call to do whatever you need. Need an oil change but don’t have time to do it yourself? No problem! No doubt these incentives are great, but are they really necessary? Is this what employees really want from their employers? Of course, no one is complaining, but it’s important for employers to know what their employees really want and expect from them. This infographic from Visual.ly covers just that. Take a look. Nearly everyone knows how great Google is to there employees. They have 16 free cafes to choose and eat from, dogs are allowed in the office and massages are offered all day. The incentives don’t stop there. In fact, they are seemingly endless. Google’s not the only company though. The concierge service? That’s Johnson and Johnson and their employees can utilize it for basically anything at any time. 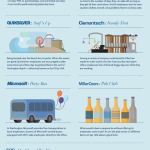 Plus, retirees can workout in the company’s gym for…forever. Netflix, on the other hand, has a no-vacation day policy. That doesn’t mean that you never get time off. It means that you don’t have a specific number of days off; meaning you can take off whenever you want. Some companies and employers may cringe at that idea, but the thought is that if you love your job and aren’t barred by a specific number of days you will always work hard to get your work done. These employees likely aren’t just taking off whenever- they need to get their work done. Want to go and take advantage of that gnarly wave you can see from your window? If you work at Quicksilver, you can go right ahead! In fact, they encourage their employees to take some to time to hit the waves when they are nice. Seeing as though they are right off the beach, it’s not difficult at all. There’s so many other companies with dozens of awesome incentives, but are employees truly getting what they want? A survey taken by employees and employers both shows that there is a definite disconnect in what employees want and what employers think they want. At the top of the list, employees want to know that appreciated for their work. Employers think that the most important thing for employees are good wages. See the disconnect? Take a look at the infographic at the bottom and see how the misconception between what employees want and what employers think they want can really effect productivity.